Sai bless you dear. All I can say is , Sai is residing in you and making you write such wonderful message even if it is going o be a translation. Devotees like me who do not know hindi are very fortunate to have such a sincere devotee who is taking interest and time. Wonderful ! Sai keeps showering His grace and blessings in all you do. He will. Wonderful to hear that you are Renuka's friend. You have come so close. I have indeed heard`about you and also there was a time I use to visit StaSai forum. But now since it has become necessary to register and login, I miss seeing all the simple and sincere devotees. I am glad you have taken the time to be with us too. I am also surprised and happy that you have addresse me as akka which makes me more shy and good. Thanks! I wish you goodluck and best wishes and I am sure Sai will take care of you in all endevours. I am glad Renuka had been to Shirdi. She is such a pure soul who always prays for others. Sai bless her and her family always. Kindly stay in touch Sasi. Thank you so much for your wonderful wishes. May Baba bless you, be with you and guide you always! I'm the Sai sister of Renu akka (Sivaramapuram Baba temple), she had been to Shirdi now and today she is returning to Bangalore. 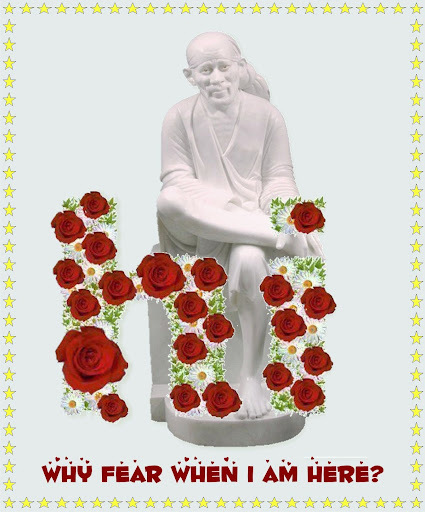 Sairam Drashtaji, you are too sweet and wonderful Sai child.May Baba bless all your wishes. Dear Kannapurni ji, Vinit ji and Subhasrini ji, thanks much for your kind words. This work is getting done by Baba's grace. I'm merely an instrument in His hands. May Baba bless all of us. Main ush bhoj ko phool saman na karddu toh kehna. Thank you so much for taking your time and posting such a wonderful translation. You have Baba's blessings in abundance. Full credit goes to Sai Ram Prakashji, Priyaji and Drashtaji. I have just done copy paste. I know how happy akka was when your parents had come for the kumabhishekham. She normally talks about you and your calls. Thanks for all your wishes. Baba dragged me here. So, I'm just a puppet. Dear Sasiravi ji, thank you for providing the prerna in English script. That enabled getting this work done by Baba's grace. My Baba shower His love and blessings on you always. Main meri kakkad aarti mein mera karunamay darshan na du toh kehna. Main tera har samay nirvign na banadu toh kehna. Main tera har karya karunamay na banadu toh kehna. Main tujhe prerna lekak na banadu toh kehna. Main tujhe meri pratna na karadu toh kehna. Main tujhe ganga samaan pavitr na kardu toh kehna. Main tujhe mera sharanathi na samju toh kehna. Main tere mann ko sheetal na kardu toh kehna. Main tujhe niyam ki shakthi praapt na karadu toh kehna. Main har maharudr mein tera rakshak na banu toh kehna. Main tujhe meri chatrachaya mein na rakhu toh kehna. Main tujhe har deeye mein ishwar ka darshan na karadu toh kehna. Main tere haathon ke taali mein alokik shakthi na bardu toh kehna. Main tujhe guru purnima ke pavan parv ki yaad na diladu toh kehna. [ If you chant the holy word of “Om” in front of me; I’ll bestow every bliss of this world on you]. Baba's leelas are amazing. I thought I would translate a chapter a day. But, Baba did not let me stop . The translation from Hindi to english may not have conveyed the flavour of the Prerana. But, the essence is captured. If I don't give.......in return.....then you say"
In other words, each verse is a promise of Baba to His devotees. He asks us to do something, and promises something in return. I understand that this Prerana is an extended form of Baba's 11 assurances. May Sai Bless all of us with Shraddha and Saburi. You made my wish and prayers happen so fast. Sai bless you. I am sure SAI PRERANA will be spreading now in english like a wild fire. I am so happy for you and for all the other devotees who will be immensely benefited too. I have already sent in a word to some of my friends. Thanks a ton for your precious time. Page created in 0.398 seconds with 69 queries.